Turner’s presentation will inaugurate a new series of short talks – called the First Friday ArtTalk – during the ArtWalk by prominent artists and art professionals several times a year. His presentation will start at 5 pm – a half hour earlier than the usual ArtWalk beginning – on June 6 at the Jacobs Gallery, which is on the lower level of the Hult Center for the Performing Arts at Seventh Avenue and Willamette Street in downtown Eugene. The Jacobs Gallery, which is showing the Eugene Architects in Schools Exhibit during June, will be the first stop on the free monthly walking tour of downtown art spaces. A University of Oregon graduate, Turner has been working with found or re-purposed objects and welded steel for over 20 years. 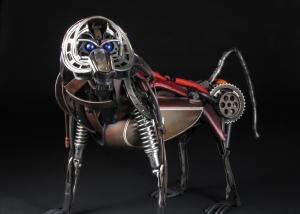 His work has been featured in hundreds of exhibitions, and is in public and private collections around the world, including Ripley’s Believe it or Not, the Boston Museum of Science, and the UO. His art has been featured in such publications as Juxtapoz, Surface China, and The Guardian (UK). Turner is represented by Woolff Gallery (London) and The Shop (New Orleans) in addition to other contemporary galleries in the United States and abroad. He uses symmetry, repetition, and intricate detail in his work to balance the darker contemporary themes he explores. His artistic philosophy is, “Between seeming contradictions lie greater truths,” and much of his subject matter explores the relationship of opposites. The regular ArtWalk will continue on from the Jacobs Gallery to MODERN at 207 East Fifth Avenue at 6pm, followed by stops at Studio Mantra, MECCA Gallery, and The Lincoln Gallery. Visit www.lanearts.org for more information.